On this page you'll find our explanation of the benefits to raising your Master Lv and how this is done. Use this as your guide when you level up your Master Lv. The best thing about raising your Master Level is that it gives you a higher maximum AP. If your maximum capacity is low your AP will fully recharge in a short time and you can't generate any more. You also get less benefit from Items like Golden Fruit which recharges your AP to 100%. The next best thing is that your Cost limit for Party Setups gets an increase. 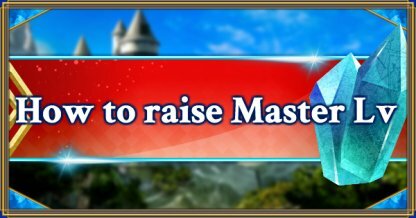 As long as your Master Level remains low, so will your Cost limit, so even though you manage to get hold of a High Star Servant, it will be difficult to fit them into your Party. ▲A Party Setup with only 5★ Servants and Craft Essences would have a Cost of 140. This is more than the highest possible Cost limit, so whatever your Master Level you will need to use cards with a lower rarity. The final benefit from raising your Master Level is that your maximum number of Friends increases. At the start of the game you can only have 10 Friends on your list - by the time your reach Master Level 62 you can register 50 Friends. Friends are important early on in the game so this is a big plus point. You won't find any Quests that give large amounts of EXP in FGO. Even the most effective Quests require a great deal of farming. So raising your Master Level can be a real grind - and there are no shortcuts. After Level 120 the amount of EXP you need to progress goes up a notch, so leveling up from here becomes even harder. However the Cost and AP gains get smaller, so you don't need to be so conscious about increasing your Level from this point. Since there are no Quests in FGO that only award Master EXP, essentially you can continue to gather Items while you earn experience points. You can get EXP and Items to some extent in Free Quests. 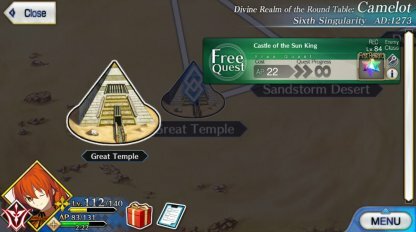 If for the time being you only want to earn Master EXP, Free Quests found in the Main Story Quests are a good place to start. There are some Craft Essences that can raise the amount of EXP you earn. The effect works even if they are equipped to Support Servants, so if you can find a Servant with a Craft Essence like this on the Select Support screen, pick them to boost your EXP. Summary for each chapter of Quests with high Master EXP rates.